US President Donald Trump’s January 27 executive order banning travel to the US from seven majority Muslim countries and halting all refugee approvals for 120 days has prompted a hypocritical and duplicitous response from Canada’s Liberal government. The day the ban came into effect, Prime Minister Justin Trudeau issued a tweet that was widely promoted by the liberal media in Canada and around the world as a challenge to Trump’s policy, even though it did not mention the president, his order, or even the US. “To those fleeing persecution, terror & war, Canadians will welcome you, regardless of your faith. Diversity is our strength #WelcomeToCanada,” tweeted Trudeau. A BBC report hailed the tweet, under the headline, “Canada’s Justin Trudeau takes a stand.” The tweet has since been shared more than 400,000 times, giving an indication of the widespread hostility to Trump’s brutal, discriminatory measure. However, Trudeau’s pose of opposition to the travel ban has nothing in common with the humane sentiments that have animated protests internationally over the past 10 days. Since coming to power in November 2015, the Liberal government has struck a phony “refugee-friendly” stance, the better to press ahead with a right-wing agenda of expanded militarism abroad and austerity at home. Canada’s refugee policy only appears “generous” in comparison with Trump’s reactionary anti-immigrant measure. In reality, the Liberal government’s much ballyhooed intake of 25,000 Syrian refugees comprised only a tiny fraction of the millions forced to flee their homes as a result of “regime change” wars that the US, with Canada’s support, has led and instigated in the greater Middle East, from Libya to Afghanistan. The majority of the Syrian refugees accepted by the Trudeau government in 2015-16 were privately sponsored by churches, charities and refugee-support groups. All were subjected to a strict screening process, which included close collaboration with the US Department of Homeland Security and the exclusion of all single men on the claim that they posed a greater threat to security. Many who did not make the cut have been left languishing in overcrowded refugee camps in Jordan, Lebanon and other countries. Those accepted into Canada face an uphill battle. Reports have emerged of many of the 25,000 Syrians being forced to rely on food banks and donations from charities. And unbeknownst to most Canadians, Canadian warships, under the previous Harper government and now Trudeau’s Liberals, have participated in NATO patrols of the Aegean Sea aimed at enforcing the European Union’s brutal policy towards refugees, thousands of whom die each year attempting to cross into Europe by sea. Underscoring its indifference to the hundreds of thousands impacted by Trump’s ban—including many who have lived in the US for years—the Liberals announced last week that Canada will not increase its pitifully low refugee-placement target for 2017. 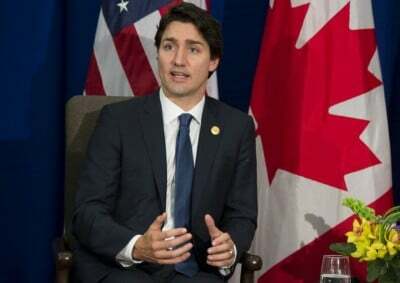 The government has also rejected any suggestion it suspend an agreement with Washington preventing migrants from seeking asylum in Canada if they have arrived from the US. Legal experts argue that Trump’s order is in flagrant violation of the Canada-US “safe-third country agreement,” which is itself a reactionary measure aimed at limiting refugees, especially from Central America, from seeking asylum in Canada. “At this snapshot in time, the US is clearly in breach of the conditions necessary for this agreement to be in place and, for that reason, we’re calling for an immediate suspension,” commented Sharry Aiken, an associate professor of law at Queen’s University. The attempt to portray Trudeau and his Liberal government as crusaders for a more tolerant approach to refugees is even more dishonest given Ottawa’s determination to collaborate intimately with the Trump administration, so as to ensure that Canadian big business retains privileged access to US markets. Trudeau came to power pledged to deepen the decades-old Canada-US strategic partnership, and he has no intention of allowing the coming to power of the most right-wing administration in US history—an administration committed to trade war, confrontation with China, and a massive expansion of the US military, including its nuclear arsenal—to get in his way. He shuffled his cabinet last month, placing individuals with strong US connections in key posts, the better to woo Trump and his cabinet of generals, billionaires, and rightwing ideologues. Former Lieutenant-General Andrew Leslie, who developed close contacts with the US Army during the brutal war of occupation in Afghanistan, was appointed parliamentary secretary to Foreign Minister Chrystia Freeland and tasked with playing a leading role in managing Canada-US relations. Ottawa also lost no time in indicating its readiness to cede to Trump’s demand for a renegotiation of the North America Free Trade Agreement (NAFTA), even signaling it is ready to strike a bilateral deal with Washington at Mexico’s expense. Top Canadian officials have also indicated that discussions on closer military-security cooperation between Canada and the US are far advanced, including potentially dramatic hikes in military spending and Canadian participation in the US anti-ballistic missile shield, a technology aimed at giving the US the means to prevail in a nuclear war. This course will inevitably result in Canada’s further integration into the aggressive war plans of US imperialism. Already within the first two weeks of the new US administration, Trump and his senior officials have placed Iran on “notice,” indicated support for the break-up of the European Union, and threatened to block Chinese access to islets its controls in the South China Sea, an act that would be tantamount to a declaration of war. Whereas the European ruling elites, above all in Germany, have reacted by calling for a more aggressive assertion of their own imperialist ambitions in opposition to Washington, Canada stands out for its willingness to do everything it can to accommodate itself to Trump’s right-wing, “America First” program. The Liberals are trying, as they have done for decades, to give the aggressive pursuit of Canada’s imperialist interests a “progressive” gloss. The Trudeau government has expanded Canada’s involvement in the Mideast war, is deploying 450 troops to Latvia as part of a NATO build-up aimed at encircling Russia, and is preparing to send 600 soldiers to Africa, ostensibly as “peacekeepers.” The African initiative is currently on hold, however. This is because, as bluntly related by government officials to the press, the Trudeau government first wants to make sure that the Trump administration does not have more pressing “asks” of the Canadian military. Trudeau’s refusal to criticize Trump’s anti-democratic, xenophobia travel ban has been met with an overwhelmingly favourable response in the Canadian media.